Porsche has decided to jump on a particular bandwagon of our time, and has introduced a new version of their popular Cayenne SUV that has a dramatically sloping rear roofline. Continuing a recent automotive tradition of ignoring what words actually mean, they’re calling it a Coupe, which it definitely isn’t. It is, however, an appealing-looking fastback SUV, and that’s not fundamentally a bad thing. Of course, that sportier roofline and panoramic roof are going to eat into both rear seat headroom and overall cargo room (22 cubic feet, as opposed to 27 in the Cayenne), so unless you really love fastback designs, you’d probably want to stick with the more wagon-like normal Cayenne. The rear seats will be individual buckets instead of a bench in the Coupe, and rear seat passengers will sit 1.18 inches lower, which will help a bit with headroom. Also, there appears to be a houndstooth upholstery option, which I think is quite fetching. 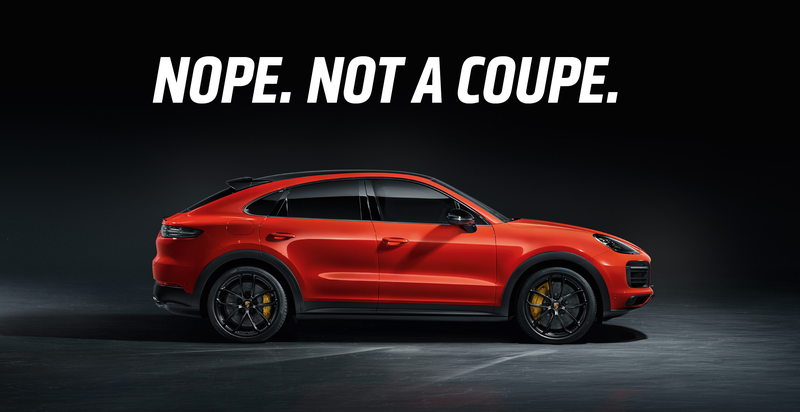 The Coupe will come with a choice of Porsche’s 3-liter V6 making 335 horsepower, which will get this four-door fastback SUV non-coupe to 60 mph in 5.7 seconds, or, if that’s not quick enough, you can opt for the 4-liter twin-turbo V8 which can let you run away from the meaning of words to 60 mph in 3.7 seconds, and have a top speed of 178 mph, faster than any dictionary can travel, so you can run away from being told that your four-door SUV is not a coupe. If you’ve really been wanting a Cayenne but also wanted something that’s shaped more like a Chevy Citation, all you need is $75,300 for the Cayenne Coupe or $130,100 for the Cayenne Turbo Coupe. just call them fastback SUVs, okay?